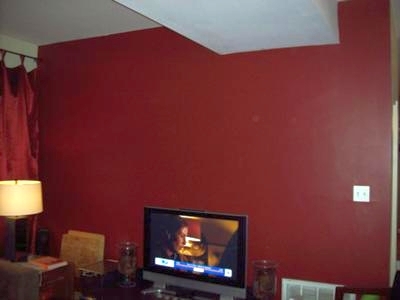 My wife and I chose to paint the far wall of our living room a red brick color. We wanted to give the room a little more flair while keeping the other walls neutral, to make the space feel larger. We chose the red color in particular because it matched the stain on the dining room chairs that were already in the room. The toughest part is cutting in the darker color against the lighter walls and ceiling. Sometimes blue tape can still pull off fresh paint or allow fresh paint to seep under it. I found it best to use a saturated brush and a steady hand / a wet rag at the ready. Click here to share your accent wall idea and see your name in lights! Good tip about the brush, and edge tool or card would do the job too. I like the red, it is very rich and makes the room feel cosy. But I would use a less shiny finish. Return to Accent Wall Painting Ideas.